This stunning villa in the Key West style built with plenty of space on two levels for eight persons has a special flair - Caribbean feeling in the holiday. 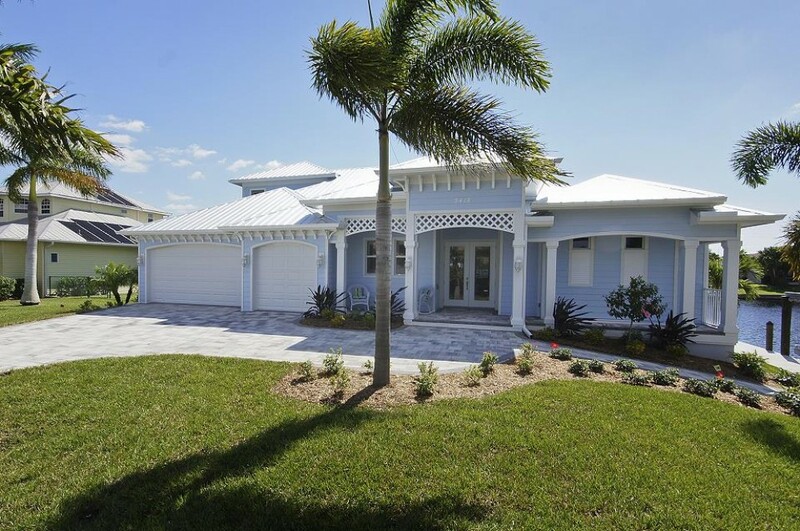 A villa in which nothing is missing, this ideal location in the southwest of Cape Coral with a very short distance with a rented boat to the river. The Villa Caribbean Breeze is very high quality, modern and furnished with great attention to detail. Outside, there is besides the large pool and terrace area nor a balcony, adjacent to the billiard room and a reachable by a spiral staircase terrace on the 2nd floor, additionally a large boat and sun deck with captains walk. Plenty of opportunities to watch the beautiful sunset in Florida. Another feature of this villa is a special water treatment plant. It uses no liquid chlorine, but the salt plant produces chlorine gas, which will be added to the water by a particular system, as needed. As a result, the water is substantially compatible with the skin and causes no skin irritation in general. This villa will exceed all your expectations!!! Cape Coral, located by the warm waters of the Gulf of Mexico, is a real paradise. The climate is very pleasant not only in the winter. Even in the summer, you can feel very well. Florida has an average of 330 sunny days a year. The temperatures in the fall don’t drop under 20 - 23°. In the midsummer, the temperatures are between 28 - 35°. A light breeze crosses, however, the Gulf of Mexico. In front of Cape Coral, there are hundreds of inhabited and non-inhabited Islands. We are 4 couples from Toronto. We absolutely loved every aspect of the home. The cleanless, attention to detail, pool, lanai, the canals and Cape Coral location were all incredible. We will highly recommend this house and we will dedfinately return for another visit, Thanks to Nicole for her help!